Travelers can embark on a culinary adventure this summer, with Blount Small Ship Adventures’ Food & Wine Discovery, cruising through the Islands of New England. On this one-of-a-kind itinerary, guests will set sail to experience the culinary classics of New England while cruising through Nantucket, Martha’s Vineyard, Block Island and Newport, among other ports, and enjoying a variety of optional tours through the local vineyards and wineries of each destination. For a limited time, travelers can also save up to 20 percent, or up to $600 per person, on all departure dates. 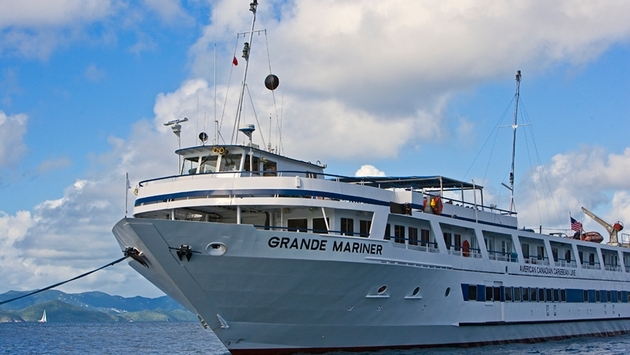 The six-night, seven-day itinerary departs Warren, RI on June 24 and July 13 aboard the Grande Mariner, and July 18 aboard the Grande Caribe, to navigate the eastern coastline through a variety of waterways surrounding the islands in New England. Travelers will sail through the islands of Cuttyhunk, Nantucket, Martha’s Vineyard and New Bedford in Massachusetts, and to Rhode Island through Block Island and Newport, before returning to Warren. Each port incorporates an optional tour for travelers to experience the local vineyards and breweries of each destination, including the popular Cisco Brewery in Nantucket and Westport Rivers Winery in the seaside city of New Bedford. Once docked in Newport, travelers will have the opportunity to partake in a walking tour with Newport Gourmet Tours, where guests will tour the town’s best restaurants and sample delicious cheese and wine at some of the city’s most gourmet shops. Travelers will enjoy lobster on the menu each day along with a traditional New England-style lobster bake en route to Newport. At night, guests can soak in the sounds and stories of the sea coming alive during onboard entertainment in Martha’s Vineyard, followed by an evening entertainer in New Bedford introducing guests to “A Fisherman’s Life.” All Blount cruises include three meals daily with menus that are fresh, creative and often reflect the local cuisine, refreshments and snacks 24-hours a day, plus guest lectures and workshops. Blount cruises also feature a BYOB policy, with mixers and set-ups for cocktails available throughout the day, along with complimentary house wine and beer offered during lunch and dinner.